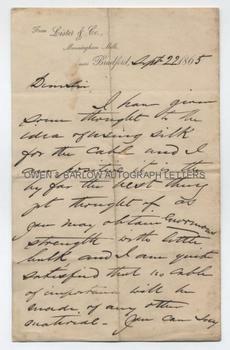 SAMUEL LISTER Autograph LETTER Signed. Samuel Cunliffe Lister was a British inventor and industrialist. He was the inventor of the wool combing machine, the velvet loom and the railway air-brake. ALS. 2pp. Lister & Co., Manningham Mills, near Bradford. September 22nd 1865. To "Dear Sir". "I have given some thought to the idea of using silk for the cable and I am positive it is the by far the best thing yet thought of, as you may obtain enormous strength with little bulk, and I am quite satisfied that no cable of importance will be made of any other material. You can say that I am quite willing to take a patent and pay all expenses. Yours truly, S.C. Lister. P.S. I should very much like to see your friend. I shall not be at home on Saturday but on Monday." 8vo. Approx 8.25 x 5 inches. 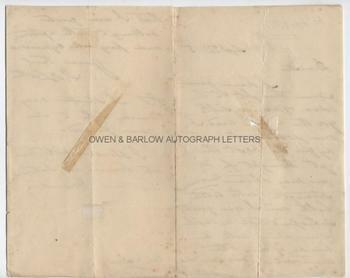 The LETTER is written on the two outer sides of a folding sheet and so is ideal for framing without losing any part of the text. Mounting damage to the blank versos, resulting in small hole and tear. Some very light foxing and age toning. All else very good. An interesting letter. Samuel Lister began work on finding a way of utilising the fibre contained in silk waste in 1855 and, eventually, perfected the silk-combing machine. The cost of development, however, almost bankrupted him. 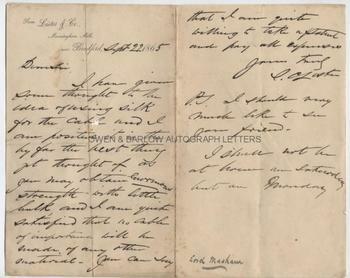 It appears from this letter that he was also experimenting with using silk fibres in the construction of a cable. Possibly, this was in connection with the Trans-Atlantic Telegraph Cable, as the old cable had failed in 1858. Efforts to lay a new cable in 1865 had been hampered when the patent steel wire cable broke after 1,186 miles of cable had been laid by the steam ship, the Great Eastern. Samuel Lister revolutionised the textile industry in the North of England in the 19th century. In 1891 Samuel Lister was ennobled as Baron Masham.